My family had some connections with Joe Kennedy and his sons from early on. My mother’s father, Tom Carens, was the Washington correspondent for the Boston Herald in the Roosevelt years and ultimately returned to Boston as one of the honored sons of Erin, Vice-President of The Boston Edison Company and the president of The Clover Club, a sort of Irish version of The Union League. As such he was courted by Joe and young Jack during the latter’s earlier runs for office. Later, my dad made some clothes for JFK. Apparently the up-and-coming politico ordered them from one of his accounts in Boston and we made them up. 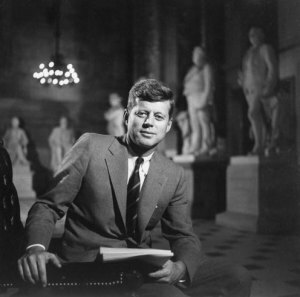 Hard to say which of the thousands of photos of JFK in the White House pictures him in his Norman Hilton grey worsted suit, narrow lapels, easy, undarted expression. But it's for sure that some of them do. My father was a true Kennedy man, and not just because of that. He gave me a book called One Brief Shining Moment, a pictorial biography of Jack by William Manchester. You could tell just from the pictures that the family had style. The Kennedy family was an inspiration to us. Everyone agreed they had style. Maybe it was the influence of the Brits when the old man was our Ambassador to the Court of St. James. The British influence over the American style of the period was considerable. But the Kennedy clan made it their own, gave it the Hollywood glamour. That weathered-shingled, New England Victorian, green lawn by the seaside, wooden-hulled boat style. The smell of money wisely spent. Man, oh man. There’s no photo anywhere of Jack or Jackie looking like “gotcha!” on the cover of Us or People. No trends or fads, just slim-fitting, narrow lapelled custom suits and soft, point-collar shirts with solid dark ties, or khakis, a white shirt and a navy cotton sweater. Simple, not fussy, and classic in color and form. Chanel suits or Dior gowns for her, or a plain cashmere sweater set and a string of pearls. Norman kept a photo of Jack walking in the Cape Cod dunes on the shelf behind his desk. No matter where he moved his office, the picture went with him. 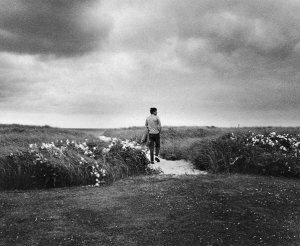 It was taken from a distance, a panorama of threatening sky, dune grass and sea oats bent in the breeze, and Kennedy walking away wearing slim dark trousers and a grey, long-sleeve knitted sport shirt, holding a jacket in the crook of his elbow, face in profile, alone. As much as it is a definitive photo of the man himself, it is a picture of modern American style. And anyone who wants to know how to look stylish while dressing comfortably should study it.